So you want to start your own embroidery business? Do you want financial independence? Do you want creative freedom? Do you want flexible working hours? Do you want UNLIMITED earning potential? If so, then owning and managing an embroidery business may be perfect for you. Initially, all you need is the drive, motivation, ability to learn and a strong desire to succeed. After that everything else will fall into place. 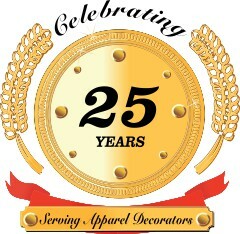 The Commercial Embroidery business is a $47 Billion per year marketplace. That means an unlimited opportunity to make as much money as you want. MESA has many customers who started a small part-time business from home, but through dedication and hard work built up to owning a shop and making a very comfortable living from embroidery. Why Start An Embroidery Business? Your business can be operated full-time or part-time. The equipment doesn't require special skills to operate. You don't need a fortune to get started. There's nothing like the satisfaction of being your own boss. With computer-controlled embroidery machines your business will produce high-quality, commercial embroidery that can be sold to anyone from collectors at a craft show to multi-national corporations. Profitable embroidery businesses can be built with a simple single-head machine for very little up-front investment. Using lease-to-own options which offer affordable monthly payments plus tax incentives, you can work from home and build a very profitable business with minimal start-up costs. The demand for embroidered goods is growing fast. More types of business and organizations are turning to embroidered wearables and other goods to help build identity or communicate a message. In addition, embroidery is finding a resurgence in fashion and boutique markets, from embroidered jeans to shower curtains, handbags and other creative applications. Works well at home or in a separate shop. Along with our big multi-head customers who are rightfully proud of their large, efficient factories, we also have many success stories from MESA machine owners who operate out of their homes. Why choose Highland over other brands? Today there are many embroidery machine brands to choose from, and the choices can be overwhelming. Highland stands above the rest in quality and value, with the highest trade-in and resale values in the industry. MESA has long been an innovator in apparel decorating equipment, and since acquiring the Highland brand of embroidery machines we've continued in this endeavor. We work closely with manufacturing to bring time- and labor-saving features, such as large touch-screen control panels, and 1200 stitches per minute on compact machines. Highland is now the only brand of embroidery machine to offer unbreakable reciprocators which are designed to not only keep you in business after striking a hoop, but save you thousands in repair bills. Highland machines now also include 90 degree presser feet, allowing you to sew closer to a cap's bill than ever before. Everyone's situation is unique. Your conversation with our experienced sales professionals can be helpful in finding the equipment that best fits your particular needs. Our ongoing education programs let you learn at your own pace. There's a lot to do to get your business off the ground, so we've made education easy to get to, when you need it and as often as you want it. MESA customers have been our greatest referral source because of our stellar service. Combined with the performance and quality of Highland embroidery machines, your confidence will grow the more you run your machines. Not just a place to pick up replacement machine parts & supplies, MESA is constantly adding new products to help you with the many different kinds of projects you'll encounter, from creative hooping solutions to thread and other accessories and supplies. MESA has helped thousands of embroiderers and apparel decorators establish and maintain thriving businesses. We've obtained our success by offering the commercial and home market what it needs - solid, quality equipment, first-rate supplies, and comprehensive training. We've been doing this more than 20 years. With this type of history, you can be assured you are dealing with one of the most reputable companies in the industry. A company you can trust! Are you ready to get informed?